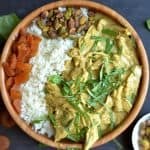 Creamy coconut chicken curry lightly sweetened up with apricots and prepared in your slow cooker or Instant Pot for a simple dinner! Fresh basil, pistachios, and dried apricots finish off the dish with the right amount of texture. I’m slow cookin my way through summer you guys. I mistakingly thought the summer would bring lazy days and more time for me to spend time in the kitchen creating elaborate meals for the family. Grilling up a ton of new dishes, spending time on our deck in nice weather, sounds wonderful doesn’t it? Summer has not been spent in my kitchen. Like at all. Most afternoons are spent at the pool, or outside somewhere doing fun things with the kids. Don’t get me wrong, I’m enjoying it, but my cooking has taken a back seat. In fact, this past week, I don’t think I decided what I was cooking for dinner until about 7pm most nights! 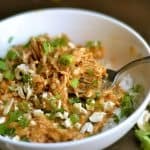 The exception was the few times I decided to pull out the slow cooker, and this was one of the meals I created. The kids were asking for curry, but I wanted to give it a summer twist with apricots. OMgoodness, we love it. Just to set the record straight about this being a summer dish, feel free to use apricot preserves in place of apricots when they aren’t in season. But back to the curry……. 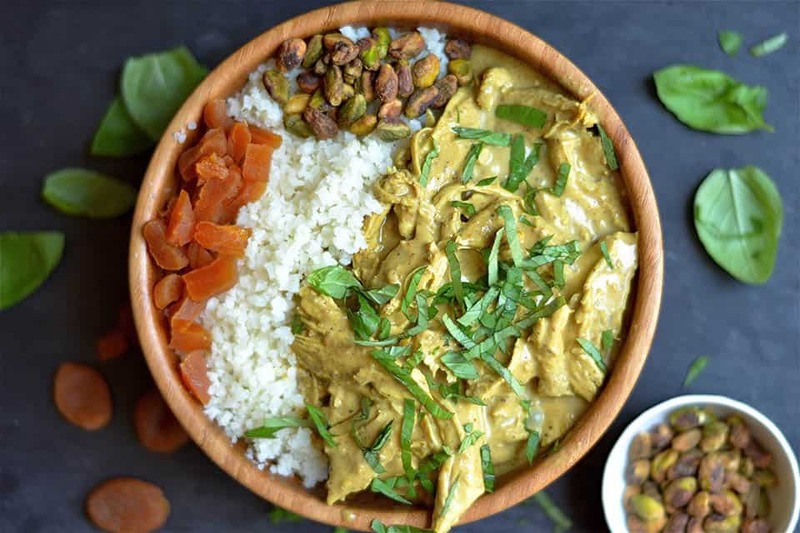 I love the earthy green curry taste with coconut milk, and the slight sweetness of apricots really makes this dish perfect! I whipped up a quick sauce in my food processor before throwing it all together in the slow cooker. The chicken shreds nicely after 4 hours. I served over cauliflower rice and topped with fresh basil, pistachios, and dried apricots. It’s just perfect you guys! And when it’s too hot to heat up your skillet or oven, you can always trust the slow cooker to help you out in the summer. I even brought the leftovers to my kids’ swim meet last week and everyone was way more interested in my dinner then the hot dogs that were selling at the concession stand. This is my way of telling you all, even in the busiest times when you want to hang outside at the pool, pack it with you! I am making a point this week to plan my dinners in advance and take them with us wherever we go. Begin by placing your chicken breast at the bottom of your slow cooker. Top with chopped onion. 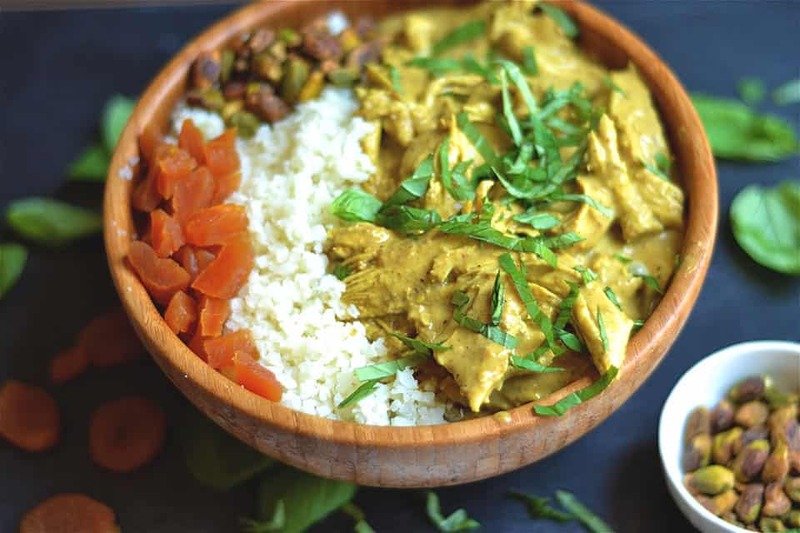 In a food processor or blender, make your sauce: add garlic, ginger, apricots, curry paste, curry powder, 1/2 of the coconut milk, vinegar, and chicken stock. Blend for a few minutes until smooth. Pour on top of the chicken. Cook on low for at least 4 hours, but up to 6 hours or until chicken can easily be shredded with a fork. Add in the remaining coconut milk. If the sauce needs thickening, add 1 tbsp arrowroot or cornstarch to 1 tbsp water, then place inside slow cooker and cook for another 15 minutes. Serve over rice, or cauliflower rice. Top with dried apricots, pistachios, and basil. 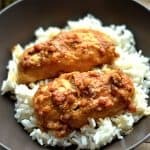 Begin by placing your chicken breast at the bottom of your Instant Pot. Top with chopped onion. Secure the lid. Select the manual function and cook on high pressure for 8 mins. Use a quick release, and open the lid. Add in the remaining coconut milk. If the sauce needs thickening, add 1 tbsp arrowroot or cornstarch to 1 tbsp water. Select the cancel function and let sit for a few minutes before serving. *Using Apricot preserves during the non-summer months is a perfect way to enjoy this dish. BUT, it also means the dish will no longer be Paleo or Whole30 compliant. You can also omit that part all together. Still delicious, not as sweet! Amy this recipe looks amazing. What is your favorite brand of green curry paste?